Oh… we woke up on a bad note this morning. she’d much rather sleep in instead. 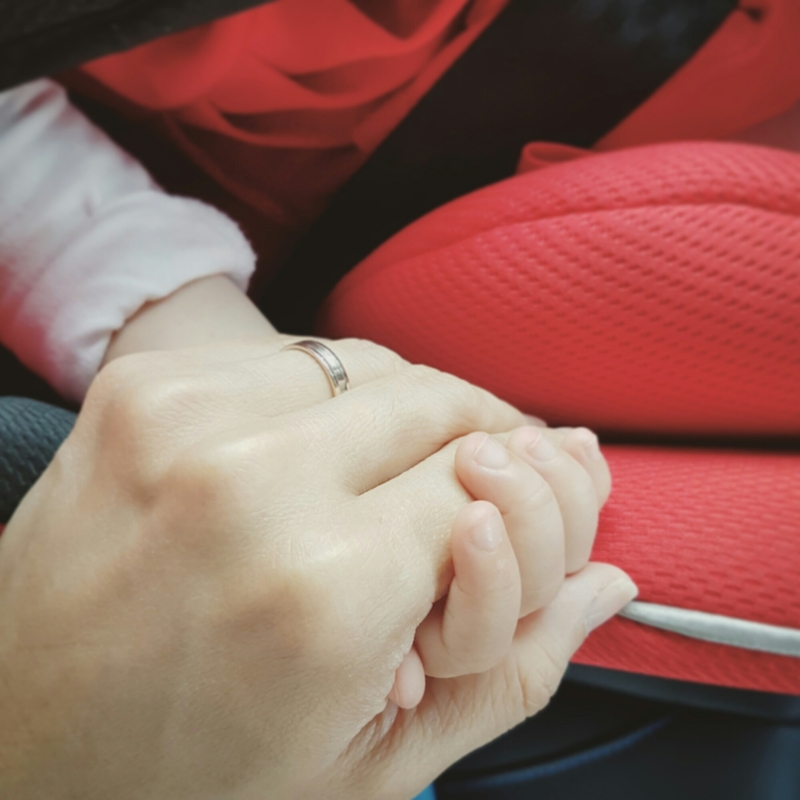 Our little lady held my hands as she gazed afar. I think, “yes this is what it means to be a mother”. I know I would forever and ever reciprocate. 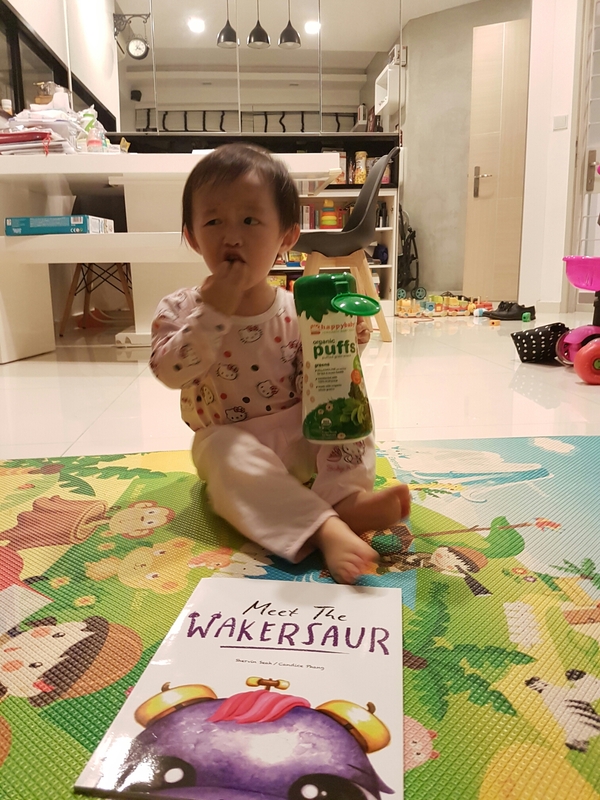 ​Little Foot is expanding her vocabulary very fast these days and getting better at trying to pronounce words which I would tell her whenever she asks me “Ah Kis?” (What’s this). Her new vocabulary of the day – “foon”. Afternoon when she woke up from nap, she was extra sticky to me. She hadn’t seen me since Friday morning as I was caught up with working late Friday night and then left early Saturday morning for a work event. She wanted to watch YouTube while she lazed awhile more, so I indulged her as we chilled around the mattress beside the bed watching her favourite Muffins Song clip. Then the app hung on the Samsung Tablet… I passed it to Papa who was on the bed to fix. “E’s foon! E’s foon!”…. referring to herself. And her face started to screw up into a epic sad face and tears welled up. So I said “ok ok… use mummy’s phone”. And she said lightened up and said “mummy’s foon… mummy’s foon…” but still wanted the Tab back. So I said ok ” trade with Papa. You take papa’s phone” (buying us time while YouTube was updating). Oh baby, you really are growing up so fast! Now you even identify things that are yours and stake your claim on them! I really have to share about this lovely evening I spent with Little Foot, we did many fun things, a rare chance these days ever since she’s started school. 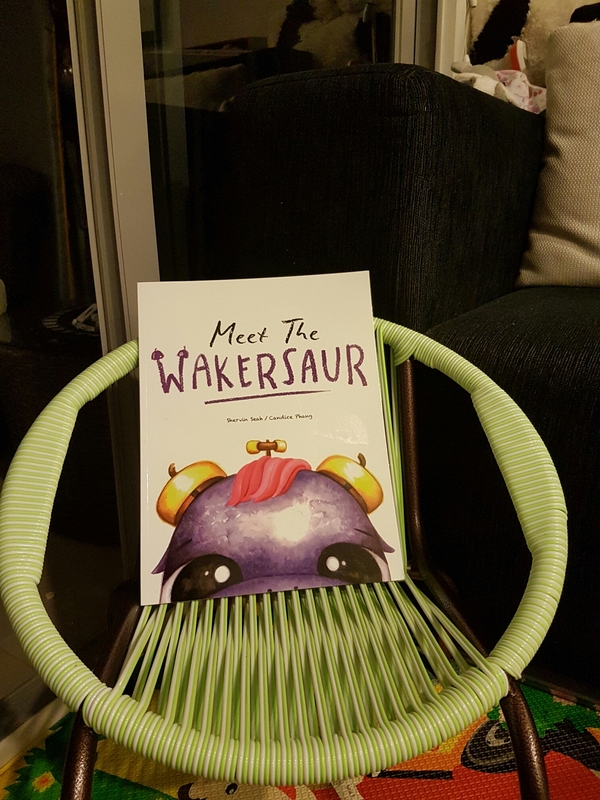 One of the memorable part was reading this book – The Wakersaur. I pulled this book out from the bottom of a huge stack of baby and toddlers books. Half expecting her to ignore me, I sat down and read to her anyway. As I started to read, I got more animated. 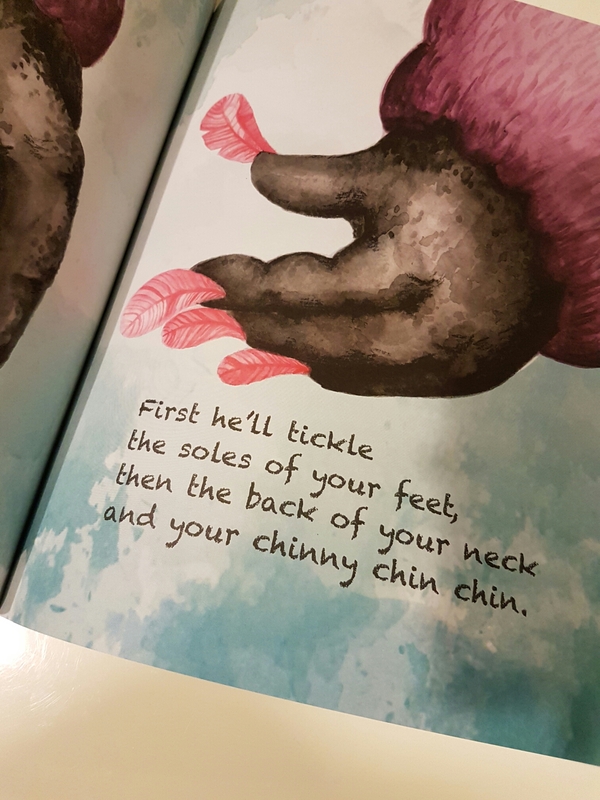 When I got to this part “first he’ll tickle the soles of your feet, then the back of your neck…” I tickled Little Foot. We finished the book without a hitch. No means feat for a toddler who prefers to order me to play YouTube videos for her nowadays. 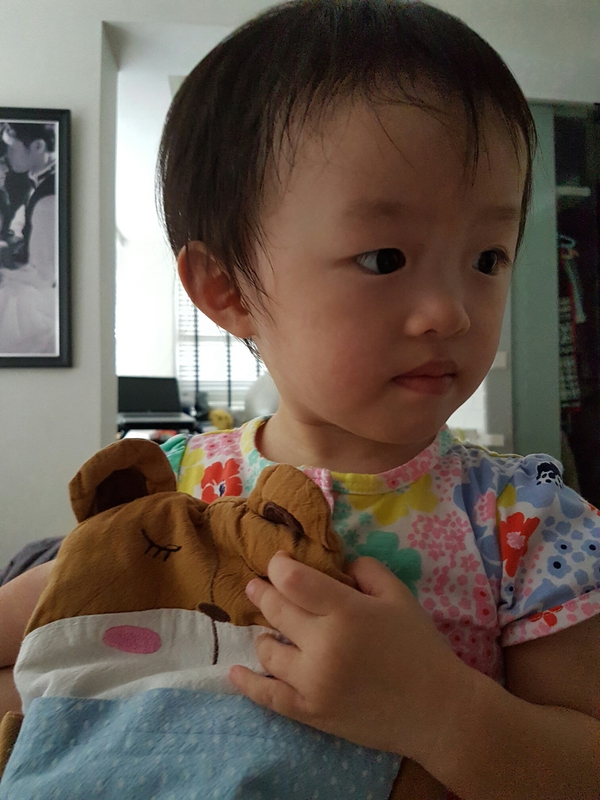 Now, at 21 months old, she’s starting to appreciate drama, starting to understand when I describe things and starting to love pretend-play types of activities. This book fitted the bill completely. For me, I loved how this book tried to break stereotypes. I guess the Wakersaur is supposed to be some kind of dinosaur, and some young kids are mightily afraid of dinosaurs (okay, The Good Dinosaur not counted). The Wakersaur was the juxtaposition of scary. I also like how it actually uses the things we as parents would do to wake our kids up. 2 thumbs up for this book. I think it’d be great for parents who struggle with getting their kids out of bed in time for school each morning… maybe a “Clock-a-doodle-doo!” might work after you read this book to them. Only thing I wish was it came in cardboard version. I am always worried about the books being torn! Our friend is hungry after reading….we actually went for a stroll and ice cream after the reading session! Some months ago, an old classmate of mine sent it to us. He wrote the book. I told him I’d go buy it in the shops, but he was so kind as to mail me one. I can’t tell you how proud I am whenever I see my friends publish. After all, we all did write too much back in University! So anyway, back then, I thought this book was too advanced for Little Foot. It required you to imagine… to guess… to speculate who or what a Wakersaur is. So I shelved it together with our enormous book collection. Yet at the back of my mind, something kept nagging me to give it a try. Glad I did this evening. Else I would have missed that bonding session when we rolled around the playmat in our living room giggling and squealing in delight. And so I take back my premature judgement that this book was too advanced for her, and again remind myself that with kids, the sky can be the limits sometimes. Thanks for the gift, Shervin. Do look out for this book in stores. I heard it’s not easy to hunt down, but trust me, when you do, it’s gonna be quite fun (and a riot!) to read it out loud to your little one. I’m walking in a mall with my Little Foot who’s loudly declaring “Walk! Walk!”. I hold her hand and she screams and giggles in glee, dragging me headlong into the crowds. Quite cute. 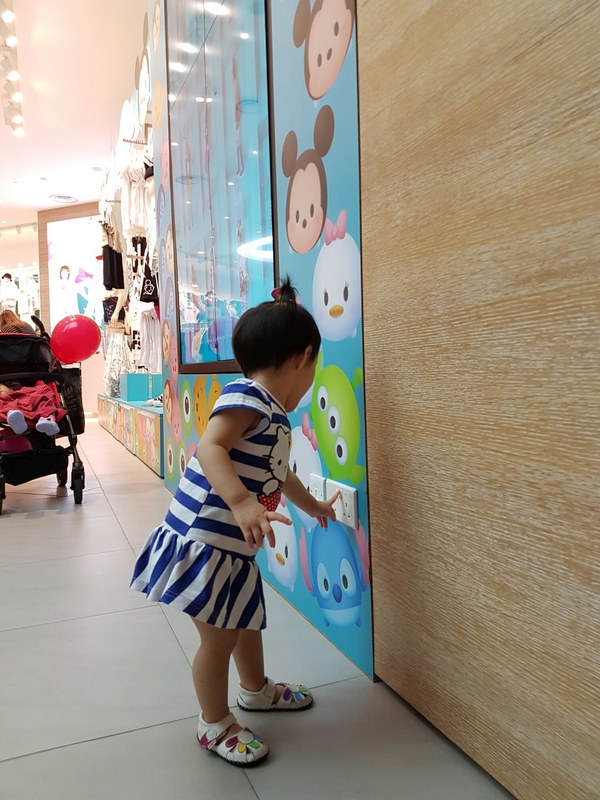 She finds a shop with things that attract her interest. She lets go of my hand, giggles and cheekily starts posing around, tentatively walks backwards, checking my reaction. I laugh. And so she thinks its acceptable, and she continues her funny antics. I can feel Papa Long judging me for laughing. 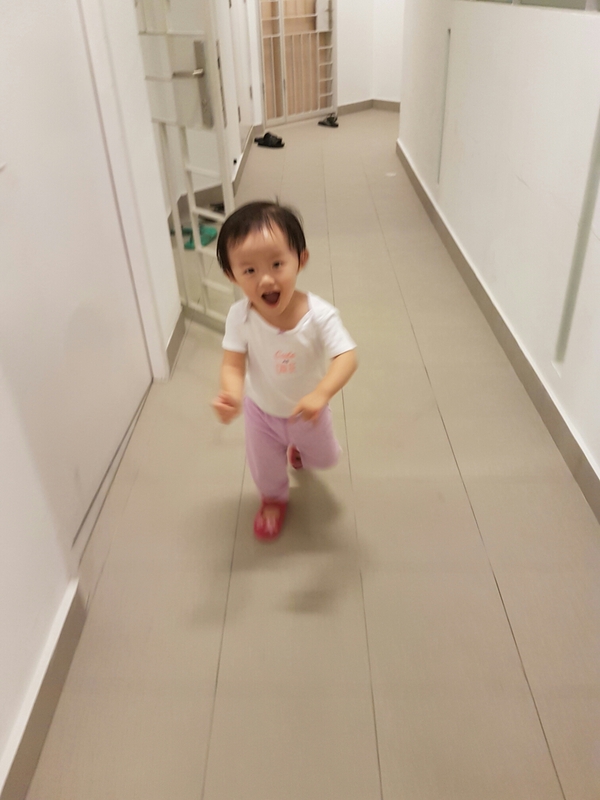 Thankfully, she hasn’t quite gotten so bold as to dash away without me, and she’s not quite as mobile as to run on her own, unless she’s running towards me into my arms. But still… I was telling her, is ok to drag your mummy through the crowds, while the rest of the world can’t quite see this 83cm todd. The nightmare then starts when I said “let’s go!”. “NO!” She’s still not yet done with the Tsum Tsyum feature wall in Bossini. And so I found myself carrying the kicking, wriggling loudly protesting toddler out of the shop. She broke free and wanted to go back. Then decided to throw herself flat on the floor in protest…. We let her lie down there as she started to kick up a fuss, and said “Come along now”… She ignored us. “Bye Bye!” we walked a slight distance away…to the horror of some passersby. She screamed and cried louder. After a moment, I walked back, picked her up, and said “Let’s go”… and then try to distract her with something else. A food offer usually works… or comfort latch (ok, some people rolling eyes now I know). There is no repeat of this scenario (to date). As we inch closer to the Terrific (some say Terrible) Two mark, there are some things that we felt we needed to do for Little Foot. Helping her understand that there are real dangers out there. I let her into the store to explore, but within boundaries. There are racks and furniture with sharp corners. we point it out to her. There was a socket she tried to put her finger into. We almost freaked out and raised our voices. She also has to understand that Mummy and Daddy are not going to be able to find her everytime and there are bad guys out there. So I try to enforce the hand-holding and no running. Letting her understand what is acceptable behaviour without stifling her curiosity. It is cute to giggle and scream in glee and dash through the crowd when you are a 2-year-old with a coconut hairstyle. Try doing that at 10 years old. Chances are some deranged short-tempered person would come up and scold you, worse, slap you. The world is not so forgiving. Sure, who doesn’t want to explore the mall? All the lights, all the displays, all the new things that triggers her senses… so many things to see, to touch. Exploring is good, but it has to be within a safe and acceptable situation. So that day at Suntec, I let her lie down on the floor and make a scene. 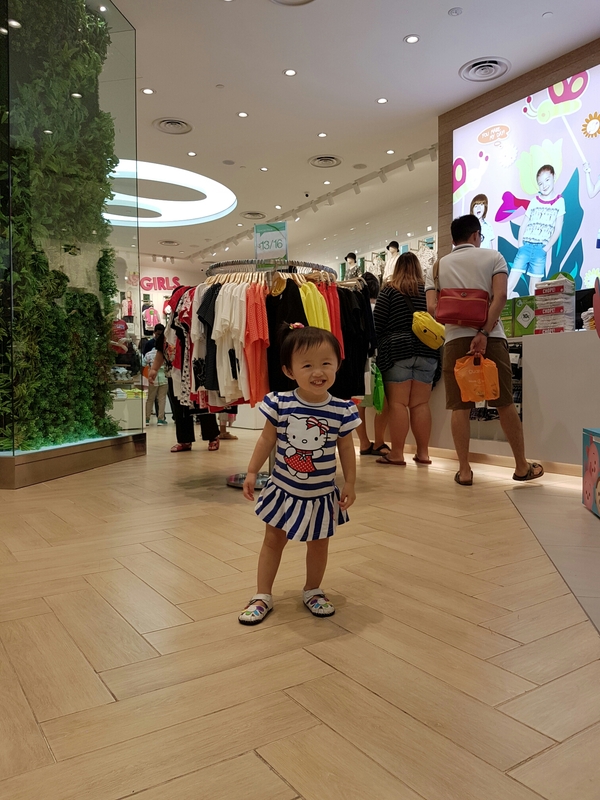 Everyone who knows me knows it’s very hard for me to walk away from her, but I really tried to harden my heart and do it, while watching her through the side of my eyes, and Papa Long standing nearby. She had to learn that it wasn’t something that was funny. At home if she does that, Papa would pretend to be stepping on her, showing her what it could be, if she did that in public – People will walk past and step the crap outta you. She had to understand that the world will not notice us short folks, and more importantly, kicking up a fuss does not mean she will get her way. Simply put, the world doesn’t owe you a thing. At 21 months, she’s also trying to grasp her feelings. There will be some crazy evenings when everything is just wrong…. playing with a toy and then she suddenly slams it in frustration (My inner self: Simi daiji?!). She can’t quite tell me why, so those are trying days too, but we still set the limit. If she’s going to get angry and throw herself on the floor, my best offer is to help her lie down there by lowering her slowly so she doesn’t knock her head to bits. And then I leave her there. After awhile, I ask her a question, to signal if she wants to call a truce and then we move on to find something else to do. Little Foot has always been, as what we say in dialect, a “Mangzang” (loosely translated to irritable) baby. We’ve taken awhile, but we’ve sort of gotten the hang of handling her tantrums. Our parenting styles are not perfect, and I make mistakes like sending her wrong signals by laughing at something she shouldn’t be doing. 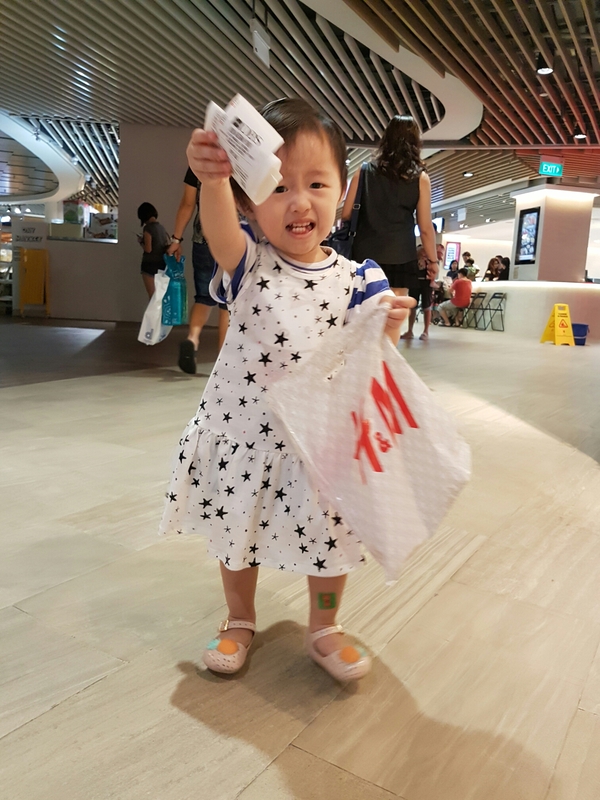 As first-time parents, we also apply some trial and error, and often we just let loose and say “ok, let’s cave in to he demands for that chocolate muffin” or close and eye when she decides to drag a plastic bag on the floor as she walks, so sometimes she gets confused by me too. At times, I remind myself that she’s a kid, and kids are entitled to having fun, and I am human. 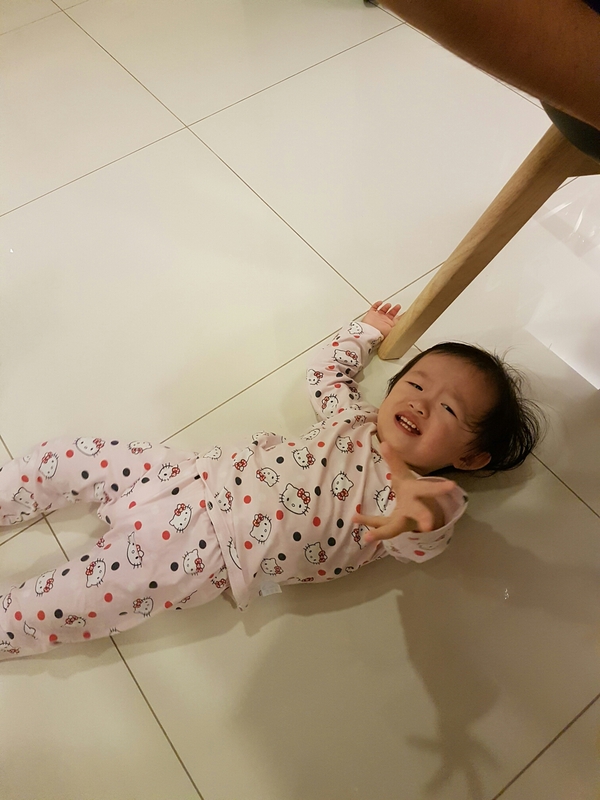 Some days, I too am exhausted and feel like saying “OK lah, you wanna roll on the floor, roll lah!”. We are all humans after all. P.S: If you see us letting our kid roll around kicking and screaming in public, don’t judge us. We aren’t doing nothing. We are doing what we need to do, to teach a life lesson on the spot. So bear with us! When I took off my shoes I saw this sticker (from the Frozen Sticker book that Little Foot received from a classmate’s birthday goodie bag) there on my sole. There I stood in the canteen. Staring at my sole. I wanted to LOL at the sight of the sticker there. One day years later, I want to look back at all these seemingly mundane yet hilarious situations and feel a warm fuzzy feeling in my heart. A baby leaves all sorts of footprints in our lives… and they have all these innocent ways of invading our thoughts, making us think of them and miss them. They have a way of making us pause in our path and smile. 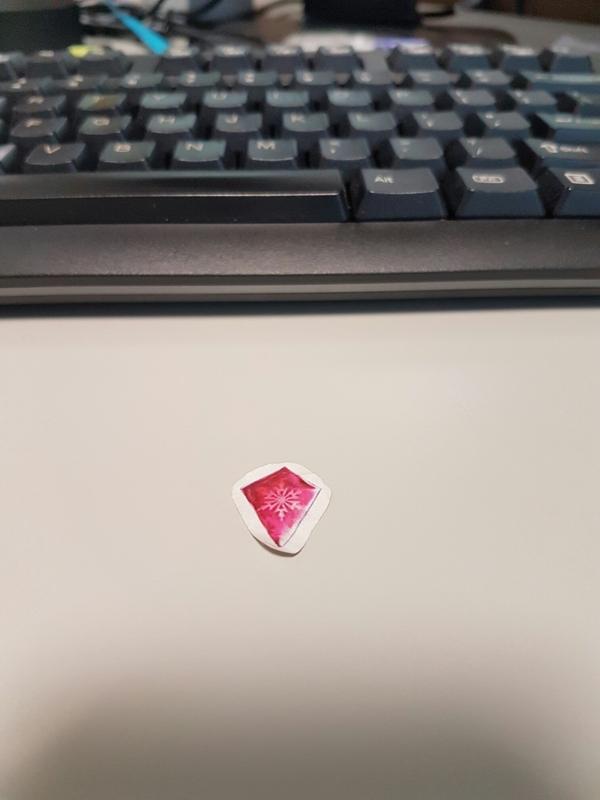 Smile at an action, a memory, even a sticker. I’m looking forward to more of these little surprises… just hope the next one won’t be something messy like tomato sauce!